Two photographs show a May Day celebration at Armco Field in Middletown, Ohio. May Day is a celebration of spring that was popular in the nineteenth and early twentieth century. Typical festivities included dancing around the May pole, shown in these 8.25" x 6.5" (20.96 x 16.51 cm) photographs. The American Rolling Mill Company's (Armco) ball park was located behind the company's general office and research buildings in Middletown, Ohio. The company believed in providing recreational activities for its employees, and sponsored the Armco Triangles baseball club. The field was also used for high school and industrial leagues as well as some national farm teams (Cincinnati Reds and Boston Red Sox). 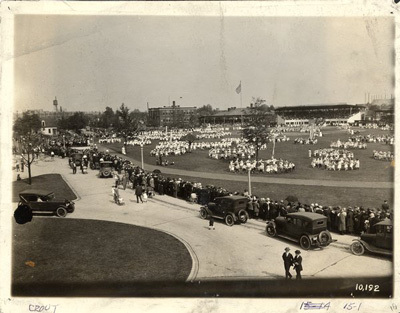 Other activities were also held at the field, including grade-school competitions, Armco plant competitions in safety, military demonstrations, and May Day celebrations.